Je kunt van de actie gebruik maken door de code tijdens het bestellen in te vullen. What can I say? Excellent service, exceptional staff and perfect cleaning! I loved the service! No only did they clean my clothing beautifully, but they also brought returned it without any delay! Friendly owner, just called to ask if we could change something in the order. They helped me without hesitation! Come and picked up the additional clothing, without charging anything, and returned it back all clean and fresh. I would definitely recommend Dry Cleaning Ocean! My experience was great! The owner got my laundry turned around early at request with no fuss or problems, which really helped me out! When cleaning your curtains there is always risk of them shrinking or losing their shape. That is why it is so important that to get this is done by a specialist. Look no further, you’ve come to the right place. Even though you might not clean your duvets daily, it is important to do it every once in a while for hygiene reasons. In order to prevent fungus, bacteria and dust mites, it is wise to have your duvet and pillows cleaned at least twice a year. You need a specialist to clean leather, suede and fur. Cleaning leather is fairly challenging. We all have them: clothes that are either damaged or that no longer fit. You could throw them away, but now you don’t have to. Are your shoes too small, or have your favorite shoes been damaged? All sorts of shoes, from sneakers to pumps, can be repaired by a cobbler. Is it time to clean your area rug? Dry Cleaning Ocean works with companies that have machines with the latest technology to give your carpet a new life. Do you have clothes laying around and don’t you have the time to bring it to the drycleaner? Don’t hesitate any longer and experience the convenience. We clean for individuals and companies. With this site or with the phone you can shop anytime and anywhere. Flexible and Reliable at Dry Cleaning Ocean. Our team is ready from Monday to Friday from 09:00 till 21:00 to help you collect the dry cleaning and to deliver it at a time of choice. 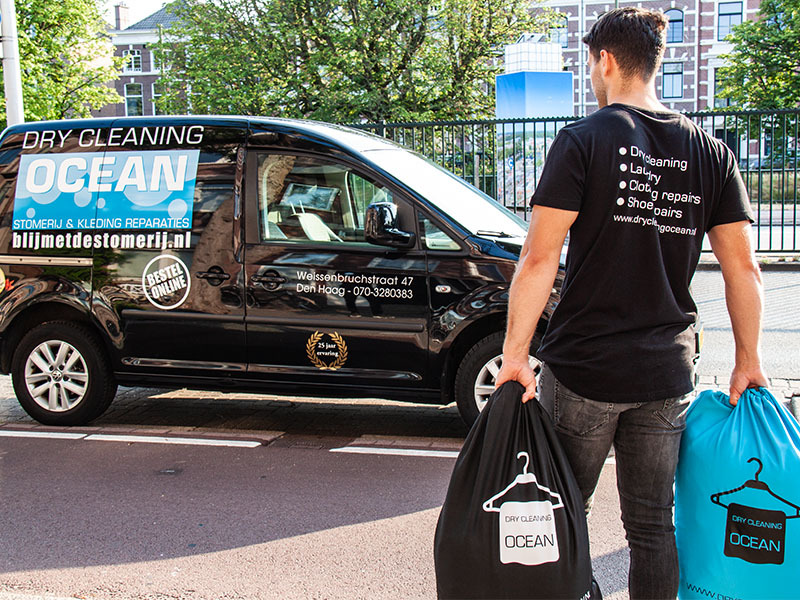 Dry Cleaning Ocean is active in these locations: The Hague, Voorburg, Rijswijk, Leidschendam, Leidschenveen, Nootdorp, Wateringen and Wassenaar. For other possibilities, please contact us.